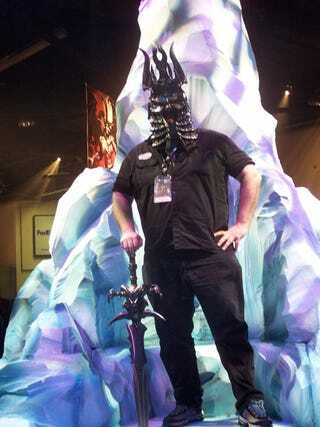 And so Fahey ascended the icy throne, taking up the mystical helm and the legendary sword of Frostmorne, long enough for this painting to be created before he once more descended. And as his might footsteps echoed down the icy cliffs, a resounding crack was heard, his heel shattering the very world. "Oh my god, this thing is so flimsy," explained the elderly attendant as Fahey apologized and quickly ran away. BlizzCon 2008 continues today, with the doors opening as I type. I'll be on hand all day with more news, more interviews, and more things to view as I try desperately not to break any more of the convention. Which character had photographers violate the rules of cosplay when snapping shots of her at a show this year?